This wonderful quote by marketing Guru Philip Kotler says it all. Gathering competitive intelligence has always been a serious marketing tactic, only it has evolved over time. The whole process is an opportunity to peek on your competitors marketing strategy, their strength and weakness so you can leverage it and come up with a better and improved plan. There are a number of marketing tools out there which can help you scoop out the information about what your rival is doing exactly and this post lists 19 most popular of those. For the sake of readability, the content has been divided the tools into the below mentioned categories. Mentioned below is a list of one of the finest competitive analysis tools. Most of them are paid and offer a trial version for business owners and marketers. So, are you ready? Here we go! Certainly one of the most popular competitor keyword research tools that can extract the keyword data you need. Just open semrush.com, type in your competitor’s URL, select the county and viola, it will show you organic and ad keywords of your rival. In addition, you can gather backlinks data, ad copies and a list of more competitors and all that in beautiful graphical charts to help you understand better. Analyze keywords and stay ahead of your competitors. One more feature of SEMrush that gets your attention is that it can show you keyword performance for both desktop and mobile. You can see data for both the devices and create a marketing strategy based on that. SEMrush blog is a really wonderful resource and offers tips and insights to make the most of its very tool. The free version extracts almost everything but you can upgrade it on a PRO plan of $69.95 to get more insights and data. Distilled did a wonderful blog post on how to use SEMrush for Competitive keyword research. Dive in to learn more. Another very useful online tool, Spyfu will let you view your competitors’ “most profitable” paid and organic keywords. The process of extracting keywords is really simple: feed in your competitors' URL in the address bar and wait for a couple of seconds for the results. Much like SEMrush, its free to use but only shows an overview. If you need more data [and you will], try the basic plan which starts at $79 per month. iSpionage offers a very simple interface and is very easy to use. This tool analyzes a website and shows graphical representation of your competitors’ ad copies, ad and organic keywords, list of competitors for Google, Bing and Yahoo. Compare your site performance with others to gain an insight on how your performance measures up. If you are looking for an alternative to the above two tools, I suggest you try this. The Pro plan starts from $69 per month. 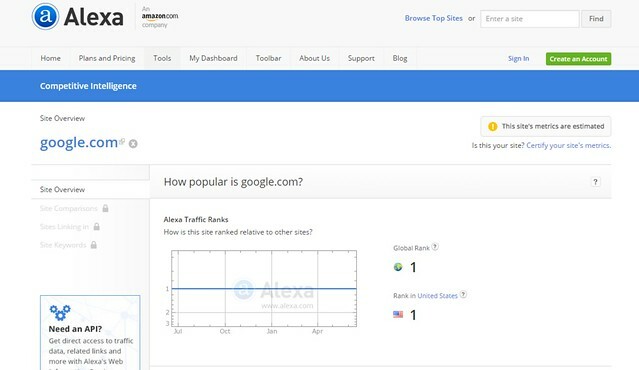 SimilarWeb is an ultimate competitive intelligence tool [top competitor of Alexa] that provides traffic insights for a website. You can compare your website and that of your competitors easily and it will provide most of the relevant web traffic and ranking details which includes how your competitors rank globally, in a country and in a specific category. Use this tool to gather monthly visits, engagement rate, top referring sites and leads in search and social. The free version lets you compare two competitors while the Pro version allow you to track a website, an app or both [depends on your requirement]. When our company stepped into of digital marketing, Alexa was one of the very first tools we used and there is no way this won't be recommended. An Amazon owned company, its 7 days free trial offers a web insight which includes metrics including social engagement, insights on paid and organic keywords, demographics, historical traffic and much more. The basic plan starts at $9.99 per month. 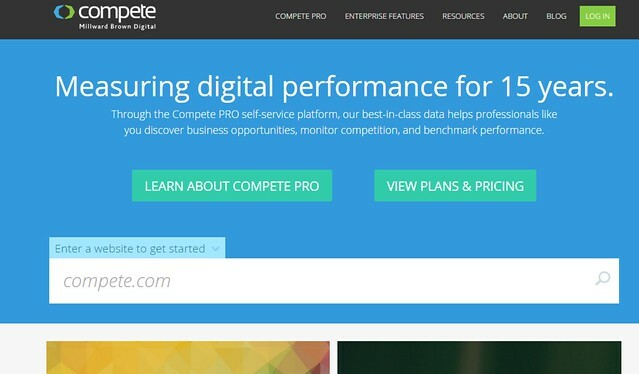 In the list of competitors tracking tools for web traffic, next is Compete.com. It’s also a paid tool [intro plan starts at $249/mn]. However, you can use it to get a brief overview to gather competitors’ data. Compete shows an overview of unique visits, similar sites to yours and source of the traffic in a graphical format after you enter a website in the search bar which is not so useful but with the pro version, any business can get access to a mass of information. Very easy to use, Open Site Explorer will generate a list of inbound links for a website you feed. You can request a CSV file and download it whenever you want. You can also create advanced reports [requires a pro subscription starting from $99/mn]. If you want to learn how to leverage this tool more efficiently, read the Daily SEO fix from Moz. 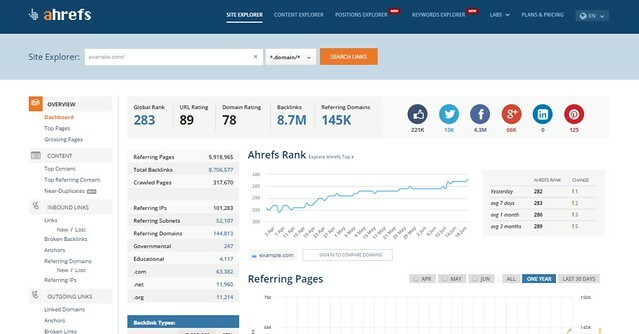 One of the very best backlink tools which you should use for spying on your competition is Ahrefs.com. Enter a URL and see inbound links and its types, outgoing links, referring domains, and historical data in a graph form. It also shows the top content from a website. 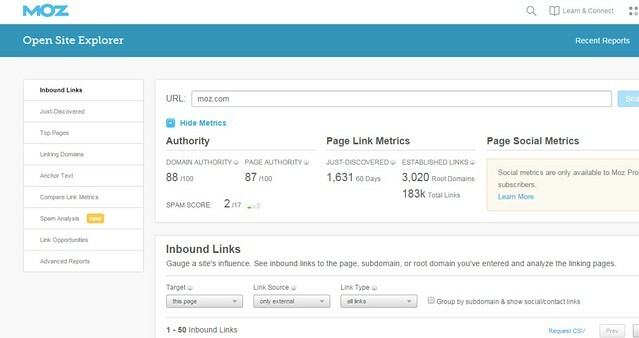 You can discover new link opportunities: analyze your current link building efforts. It lets you export the crawl and backlinks report into a CSV or PDF format as you prefer. You can access the reports anytime under Labs. Pricing: You can start with its lite plan which is priced at $79/mn. Content is one of the most important marketing strategies that can’t be overlooked. Analyzing why a competitor ranks also depends on the content they provide. 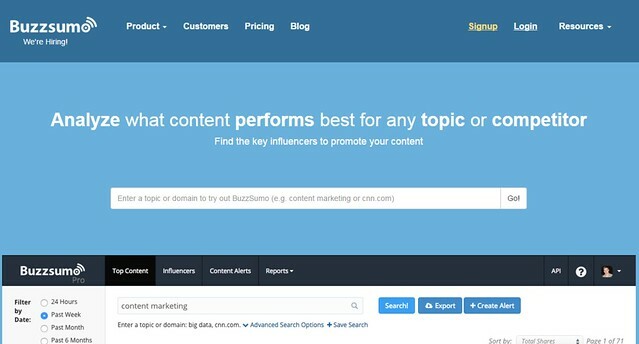 Buzzsumo can assist you in keeping track of your competition content strategy. It ranks content based on its social shares. You can filter the results by date, language, country or content type. Enter your competitors’ website or keyword and search. It will return the most shared content from their website. Buzzsumo reporting tool can help you get a detailed analysis and report on your competitors content performance. You can also set alerts for your website and for your competitors website as well. This paid tool [pro plan starts at $79/ mo] offers free trial for 15 days in its agency plan. Pages to Watch is a Facebook feature that can help you keep an eye on your competitors’ Facebook activity. Use it to gather insights on your competitors’ Facebook audience and engagement. On your Facebook page, go to insights -> click Overview. Now just scroll down to Pages to Watch and add your competitors. However, one thing to note here is that your page should have at least 100 followers. Also, you can stop spying on those pages at any time you want. Social Media Examiner explained this feature and how to use it efficiently. 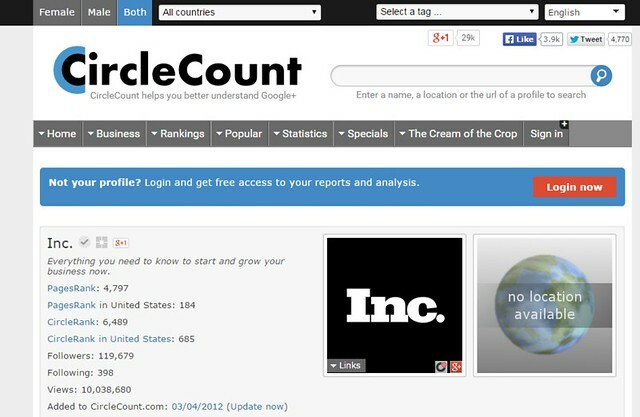 Circle Count is a free Google+ analysis tool. All you need to do is login using your Google+ account, search for your competitors’ page and wait. It will return details which include Pagesrank, CircleRank, and follower history in graph, top posts in the last 50 days and the latest 50 posts. It also offers an extension for Chrome which can be downloaded here. 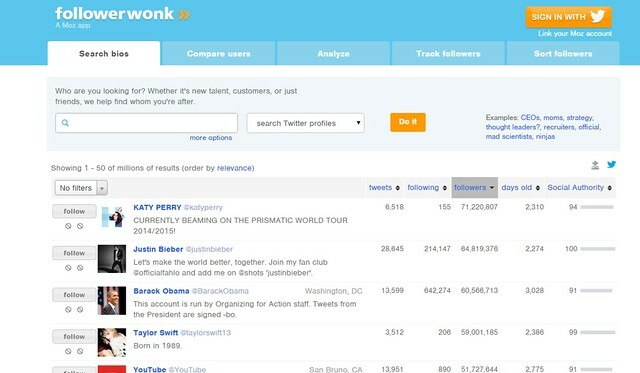 Followerwonk is a free social media analytics tool Twitter users. You can easily login to use the tool using your twitter account and add your email. You can compare your twitter account with your competitors and dig out pretty sneak information like their total tweets/day, avg tweets/week, engagement rate, social authority, mentions and more. To understand how it works and to leverage the best of it, see this Moz guide to followerwonk. A free Google service that lets you monitor web content, be it a website, news or a keyword. 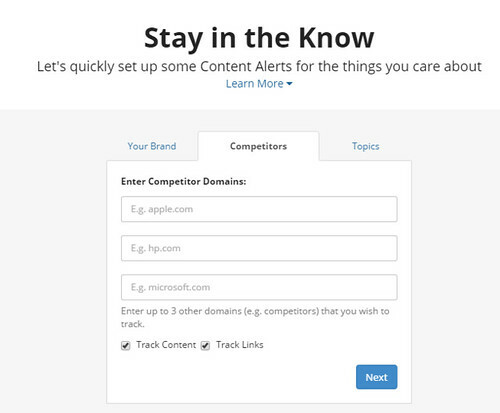 All you have to do is go to google.com/alerts -> enter your competitor website -> enter your email – set up your email options and click on Create Alert option. You can create an alert for any region, language. So far I have covered the all the aspects for acquiring competitive intelligence. But there are some areas which I haven’t covered here, for e.g., monitoring competitors’ blog post, their new product launches, sitemap changes, website design or any other makeovers. The solution here is IFTTT – a really beneficial tool for marketers that saves time. Right mixture of channels and you can have custom IFTTT recipes for analyzing your competitors’ marketing strategy. Do you identify and follow your competitors’ marketing strategy? What tools do you use for it? DO share your valuable comments below.